A longtime friend of mine says there are only two kinds of real music: Country and Western. His pun aside, there is plenty of what might be labeled “Country Music” out there today, though most of it is just drivel with an Oklahoma accent. “Western Music,” however, is a bit more difficult to locate. It has become almost extinct in the mainstream, though in the niche market there remains some outstanding talent. One of the last truly Western songs to top the American music charts was a tribute to motherhood, and a mom’s desire to protect her son. 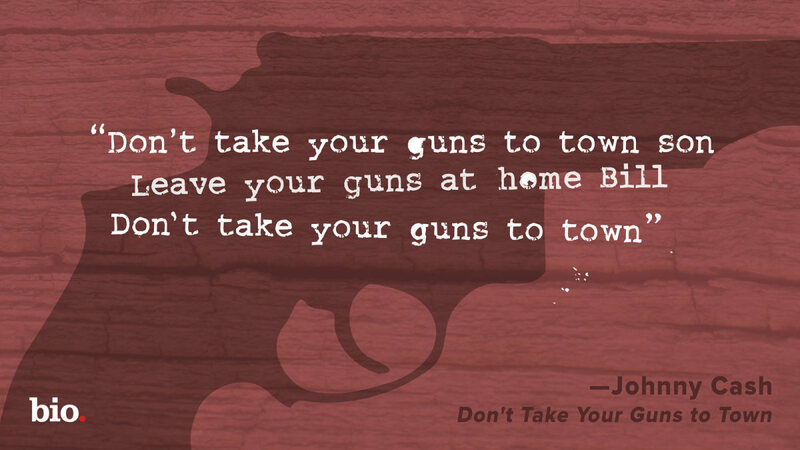 It was Johnny Cash’s 1959 hit, “Don’t Take Your Guns to Town.” It is a simple, mournful dirge about a wide-eyed, impetuous, cowboy named Bill. He ignores his begging mother’s advice and rides into town with his six-shooters on his hips. The wisdom of this warning is as practical as it is prodigious, as few things can compete with the consuming and destructive power of human anger when it is let off the leash. How many divorces, wars, murders, crimes of passion, assaults, and errant words have resulted from anger? How much personal pain can be traced to those moments of pure, primal rage fused with the means to lash out? “Don’t take your guns to town,” indeed, because when our anger gets the best of us, we are rarely able to show restraint – especially if vengeance is possible. Personally, I do not possess a firearm for this exact reason. I’m not as afraid of my neighbor as I am aware of my own potential fury. Foolish, unbridled anger is the real weapon. A Jewish proverb may have inspired Cash’s song, these words of warning from Bill’s mother. From Proverbs 16: “Controlling your temper is better than being a hero who captures a city.” This is the essence of all wisdom literature, as warnings are not given to keep us bottlenecked. They are given to provide healthy boundaries, boundaries that keep us from bumbling into disaster. It is the stronger person, the more mature person, and ultimately the happier person, who can learn self-control, rather than the one who seeks to control and conquer others. Yet, this type of self-control is so demanding, so terribly difficult to achieve, that we must not put ourselves in situations that overwhelm our abilities.